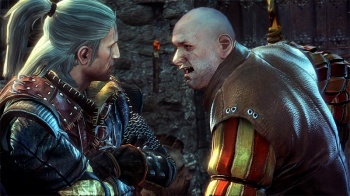 A CD Projekt staff member has overhauled Witcher 2's gameplay and mechanics in a "private afterwork project". Let's say that you're a staff member at CD Projekt, developer of the successful Witcher videogames. You enjoy playing the games as much as your fans, but you suspect Witcher 2's combat is a little sluggish and should be improved. The problem is, you can't just do this at the office. You're supposed to be working on Witcher 3, not patching the combat mechanics of a two-year old game. What's a developer to do? Well, if your name is Andrzej Kwiatkowski, you can just make the changes at home and release them as an unofficial mod that everyone can play. Despite its name, Witcher 2's Full Combat Rebalance 2 mod overhauls a lot more than Geralt's fighting style. The list of changes is about three pages long, tweaking everything from damage, to animations, to the in-game economy, and more. For the most part, these changes reflect a more realistic game world, limiting the strength of Geralt's magic while placing a stronger importance on defensive armors. The mod even lets players disable Witcher 2's quick time events; mashable QTEs are removed entirely, while those single-button "press X to not die" scenes can be optionally disabled. My personal favorite, however, is a sarcastic adjustment to the magic system found near the bottom of the list: "Changed item rarity names to reflect Witcher's low level magic setting. Items are no longer MAGICAL and EPIC." The full list of changes are below, or you can just download the mod and dive right in. At the very least, it will help you pass the time until Witcher 3 launches in 2014, or until Kwiatkowski redesigns another game from scratch. â€¢ Up to 80% increase in responsiveness per Geralt's animations. â€¢ Up to 50% increase in responsiveness per NPCs animations. â€¢ Added strafing while being locked on an enemy and walking. â€¢ Geralt can block while moving ( NEW ANIMATIONS ). Static Guard Stance is no longer required to parry enemy attacks. â€¢ Geralt automatically parries enemy sword attacks and deflects incoming arrows. It doesn't mean Geralt is invincible. It's not a 100% chance to parry and the value is not constant. It changes depending on how many hits you block in a short time and from where does the hit land. â€¢ Geralt and his attackers are no longer bouncing off parry. It allows to continue attack sequence. â€¢ Monster attacks still cannot be parried with a sword. â€¢ While using Guard Stance Geralt channels an active Quen shield. â€¢ Above listed changes to defence mechanics decreased importance of rolling in combat. â€¢ Durability of enemies is based on their defensive skills and armor, not just high vitality. â€¢ Mages and assassins don't use duration based shields, instead they have a chance to block each attack seperately, including witcher Signs. This removes the duration godmode from enemies that forced player to run away. â€¢ Letho and elite assassins will counterattack when player is relentlessly attacking them. â€¢ Arachas and Endriaga Queens learn they should defend against sword attacks after receiving few hits. â€¢ Removed knockdown effect from enemy swordsmen attacks. â€¢ Decreased the number of skills to ensure quality over quantity. Experience rewards and leveling were adjusted to current character development. â€¢ Geralt now starts with core witcher skills already learned. No need to go through Training tree before unlocking other branches. â€¢ Removed many passives from skill tree to replace them with more active abilities. Remaining passives are changed to make them more attractive. â€¢ All skills now have one level ( previously 2 ). â€¢ Aard and Igni Signs have been changed from projectile to cone area of effect. â€¢ Riposte doesn't require Guard Stance to activate, only attacking in a timed window. â€¢ Changed riposte animations ( NEW ANIMATIONS, DUH ) to prevent Geralt from sliding on enemies. â€¢ Experience points are given only for progressing through quests, not for killing enemies. This encourages role-playing without worrying about missing experience. â€¢ Geralt no longer buys witcher specific recipies from random merchants. He recalls lost memories as a part of character development. â€¢ Each enemy is balanced according to his constitution, combat skill, combat style, weapon and armor type. Following this pattern allowed to created consistent rules that every character follows. A barechested bandit won't survive more hits than a knight in platemail just because the bandit was encountered later in game. â€¢ Decreased the disproportion in stats between starting equipment and late game equipment. â€¢ Changed Geralt's starting equipment. He now carries core alchemical recipies and schematic for silver sword. â€¢ Moved the weight of character power from equipment to character development. Learned skills should have as big impact on Geralt's badass factor as items. â€¢ Geralt's armors are split into 4 categories: leather jackets, heavy leather jackets, combat jackets and heavy combat jackets. Heavier armors impose small damage penalty on Geralt. Players need to choose between max damage and protection. â€¢ Items imported from The Witcher savegames are of the same quality as in the first game. An exceptional armor and weapon remains valuable. This makes the game easier, but it is an intentional reward. â€¢ Set elixirs and oils duration to 1 hour. â€¢ Added potion overdose and heavy overdose debuffs on toxicity thresholds 55 and 65.
â€¢ Removed Fatigue penalty that decreased sword damage and damage reduction on block when Vigor was spent on Signs or Parry. It discouraged some players from using Signs becaused it decreased Geralt's sword DPS. â€¢ NPCs deal full damage to other NPCs. â€¢ Removed 50% Hit Points condition for throwing enemy off height with Aard. â€¢ Decreased Riposte damage multiplier to 1.0, but added 30% enemy parry chance debuff. â€¢ Riposte no longer costs Vigor. â€¢ Silver throwing daggers are considered as silver weapons for damage calculations against monsters. â€¢ Made range weapons ignore armors when calculating damage - armor penetration. â€¢ Inceneration, Bleeding and Poisoning effects are allowed to be active at the same time. â€¢ Made quest experience rewards more consistent. There are no longer any situations where player is rewarded with 50 experience points for one quests and 2000 for another. â€¢ Made moral choices in quests equally rewarding in terms of experience and items. Players should be encouraged more to role-play instead of weighing quest rewards. â€¢ Geralt gains knowledge about monsters faster. â€¢ Changed rewards for gaining knowledge about monsters to monster specific oils for swords. â€¢ Set minimal damage dealt by Geralt to zero ( was 5 ). â€¢ Removed bonus damage for backstabs. Geralt is not parrying attacks coming from behind, so it is a penalty already. Backstab damage bonus would be an overkill. As for the the enemies, this change removes the urge for immersion breaking behavior, like constantly rolling behind an enemy for bonus damage. â€¢ Changed arena item rewards for each wave to fit mod item progression. â€¢ Decreased amount of enemies in few arena waves. â€¢ Finally soaked boots in tutorial weigh more than dry boots!! â€¢ Moved DLC armors from starting equipment to quest rewards and shops. â€¢ Decreased the number of armors and weapons present in game. Amount of equipment is adjusted to provide smoother item progression without making huge amount of items useless stat-wise. â€¢ Weapons and armors that are present in the game were picked according to these rules: visual differentiation, witcher low level magic setting. Some items available in game assets but not used in original game were reintroduced. â€¢ Moved more quality items from quest rewards to shops and distributed them among Chapters. Player should be encouraged to regulary spend money in shops. â€¢ Decreased buying cost of swords and armors. Player should be able to buy items more often, not hoard money. â€¢ Decreased amount of loot dropped from enemies. â€¢ Removed some of the junk items from container definitions. â€¢ Made vendors specialize in certain type of merchandize. â€¢ Witcher specific recipies cannot be bought but also cannot be sold to merchants. â€¢ Added Focused Combat Stance. Geralt enters focused state during challenging encounters. It's a visual eyecandy, so it happens automatically based on calculated combat threat level. â€¢ While in Focused Stance Geralt performs piruettes ( NEW ANIMATION ) instead of rolling and uses Guard Stance idle animation. â€¢ Enemies explode when killed by mage spells. Does not apply to witcher Signs - they are not that powerful. â€¢ Made finisher animations which use Signs unlocked by upgrading Aard and Igni in character development. â€¢ Removed cutscene swords. Geralt will use his currently equipped sword in all cutscenes. â€¢ Equipped enemies with swords according to their social status, wealth and current situation in the game. For example, soldiers patrolling areas near ghost fog in Act 2 are equipped with silver swords like the story suggests. â€¢ Decreased camera shake effect used on each step of huge creatures like trolls and golems. â€¢ Removed green cloud effect from enemy poisoning FX. â€¢ Tweaked anim events in all combat animations to improve timings and responsivness. â€¢ Fixed sword oils not providing bonus damage against monsters. â€¢ Fixed Circle of Power: Endurance giving Circle of Power: Vitality bonus. â€¢ Fixed a bug where Geralt was always doing 2 more steps after roll before stopping. â€¢ Removed mashable quick time events. Single button QTEs that can end with player's death can be disabled from game options. â€¢ Decreased cooldown for returning to exploration after combat from 7 to 2 seconds. Geralt will be able to interact with environment quicker after combat. â€¢ Removed necesity to enter meditation panel to learn new skills on difficulty levels above Normal. â€¢ Changed item rarity names to reflect witcher's low level magic setting. Items are no longer MAGICAL and EPIC. â€¢ Decreased attacked enemy importance for targetting to make switching enemies easier.